HARRISON COUNTY, TX (KLTV) - After a violent roadside crash, an East Texas couple is dedicating their lives to restoring others' relationships with God. Late on May 19, 2018, Jerry and Sheri Beeson pulled off Interstate 20 at the Farm-to-Market Road 31 overpass west of Marshall. They were trying to help a man who had wrecked his Jeep Grand Cherokee earlier that night. "We've always stopped to help people on the side of the road," Sheri said. "I would want someone to stop and help me." By 12:30 a.m. Saturday, a small group of Good Samaritans had gathered on the shoulder, including the Beesons, 18-year-old Justin Woods, and 25-year-old Sylvia Keiter. From the top of the bridge, Jerry said he noticed a truck in the distance. "And he kept just passing vehicles as he was coming while the others were slowing down." According to the Texas Department of Public Safety, the 2002 Chevy Silverado pickup, driven by 48-year-old Brian Keith Woods, hit the parked Jeep. This spun the Jeep, causing Sheri and others to be struck. "I remember pushing the old man out of the way so he wouldn't get hit," Sheri said. "And I just remember laying on the ground trying to crawl to my husband and I couldn't hardly breathe." 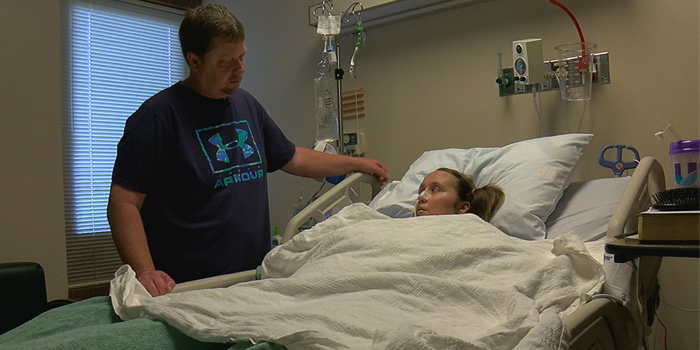 Jerry said he ran toward his screaming wife, who had been thrown into the air, before hitting the guardrail and other vehicles. Ambulances rushed her and Justin Woods to University Health in Shreveport. "And all I was doing was asking God to spare me," Sheri said. Justin Woods was also in serious condition and Keiter later died of her injuries. "I didn't think that I was going to make it," Sheri said. Looking at his wife, Jerry said he was surprised by her calmness and a peace that had come over her. "When I got to her, her leg look a bomb went off next to it, you know, and so she just kept saying, 'Jesus help me. Jesus help me.'" She suffered from a pelvic fracture, broken ribs, damaged knees, and lost muscle groups in her leg. She also lost most of the skin on her leg, along with cuts, scrapes, and bruises. According to Jerry, the initial prognosis from trauma surgeons was not promising. "Mr. Beeson, it's the worst leg we've ever seen still attached to the body. We are going have to amputate. You know and you listen to that a couple times and then you -- something just wells up inside you and says, "No that's not going to happen.'" Hoping for divine intervention, they turned to social media by posting regular updates that linked friends, family, and total strangers from around the world. Some even organized simultaneous prayer. "I've had so many people reach out to me on Facebook and just tell me to keep going strong," Sheri said. That's helped her endure more than 20 surgeries to save her life and her leg. "I've learned I have more faith than I ever thought I did," Sheri said. Her progress, even through setbacks, has amazed her followers and others at the hospital. "She's moving her foot. She's moving her ankle. She's moving her toes," Jerry said. "You know, of a leg that's not technically attached, you just have to believe that there's more to it than this." It's become clear that Sheri's defying the odds, while transforming the couple's faith in the process. "I know the Bible says, you know, if you have the faith of a mustard seed -- and I have that much. And I hang on to that," Sheri said. Enduring weeks of recovery in the intensive care unit, there's also been a lot of time for reflection. "I'm not a perfect person and I have hope," Sheri said. "And I guess hope keeps me going." "Like Sheri said, you know we're not bad people. We probably (weren't) living our faith the way we should, by any means. And despite that, God still cares enough, you know, for us." Knowing each day is a gift, the couple wants others to see what's possible through the power of prayer. "God spared me for a reason," Sheri said. "And that's what it was. And if they want to call that a miracle, then it's a miracle." Jerry says this test of faith has also redefined love in their relationship. "Sometimes he (God) takes just ordinary people and says I'm going do extraordinary things and I'm going get all the glory for it in the midst of it. And we are those people." Sheri had another surgery this week and is in good spirits. She was released from University Healthy and transferred to Baylor Hospital in Dallas for rehabilitation. A GoFundMe account has been set up to help the Beesons' with medical expenses. Click here to learn more. Making the most out of the lunch hour is taking on a new meaning for some East Texas women of faith. They’re feeding a hunger for spiritual growth through an hour-long bible study. Pope Francis has said sacred music gives people a glimpse of the beauty of heaven. An East Texas choir has set out to share that blessing with others.